Do I know where the septic system is located on the property? Do I know what type and size of septic system serves the home? Is the existing septic system legal? Does it have any limitations that I should be aware of before I sell or buy the home? When was the last time the septic system was inspected or pumped-out? Is it working properly? A septic system is a critical component of a home --- it collects, treats, and disperses all of the used water from toilets, sinks, tubs, showers, dishwashers, clothes washers, etc. Without a properly working and legal septic system, a home's value to the occupants or potential buyers is severely diminished. Who wants to own a home where you can't flush the toilets, take a shower, or wash your clothes? For more information about how septic systems work and the different types of septic systems see our Homeowner's Guide to Onsite Septic Systems. Before buying or selling a home, make sure that you know what the status of the septic system is by having the Health District do a records review and site inspection of the septic system, and provide you with a written report of the findings. It is not only a good idea to protect your investment, but it is also the law (Kitsap Public Health Board Ordinance 2008A-01, Section 13.D.). A Property Conveyance inspection is important to identify significant problems so they can be dealt with early in the home sale process. In 2016, significant problems were found on 16.5% of all PCIs the Health District completed (see chart below). If these problems are not identified or corrected, they can cause a lot of grief for the home sellers or buyers and even cause septic system failure after the new owners take possession of the property. For more detailed information, please refer to our Selling a property with a septic system: What, Why & How guide. Effective March 4, 2019, all properties served by a private 1- or 2-party water supply or a Group B Water System are required to have a Water Status Report prepared by the Health District prior to sale. In the past, these reports have been optional, but are now required. Water Status Report Applications should be submitted 30 days prior to property transfer to allow for any identified issues to be addressed prior to closing. For more information about the new rules, please view our Water Status Reports - Frequently Asked Questions handout. How do I know if I need a Water Status Report for conveyance of a property? You can use our GIS Mapping System to find out if you need a Water Status Report. When you view your parcel, you will be shown if you are connected to a Group A or Group B public water system; or if you are served by a 1- or 2-party private water well. There will also be an indication if the Water Status Report is up to date, or if you need to apply for a new one. Questions? Call us at 360-728-2235 and ask to speak to the Drinking Water & Onsite Sewage Program inspector of the day. My property is served by a Group A water system. What do I need to do? Group A Water Systems are exempt from the Water Status Report requirements in Kitsap County. HOW DO I APPLY FOR A PROPERTY CONVEYANCE APPLICATION AND WATER STATUS REPORT ? Please be aware: Due to laboratory timelines, Health District review may exceed 7 days if the Health District is requested to take water samples. It is highly recommended that applications are submitted prior to 30 days of closing, per the regulatory requirements. Please select the appropriate water supply type. The online application option includes septic and water review. 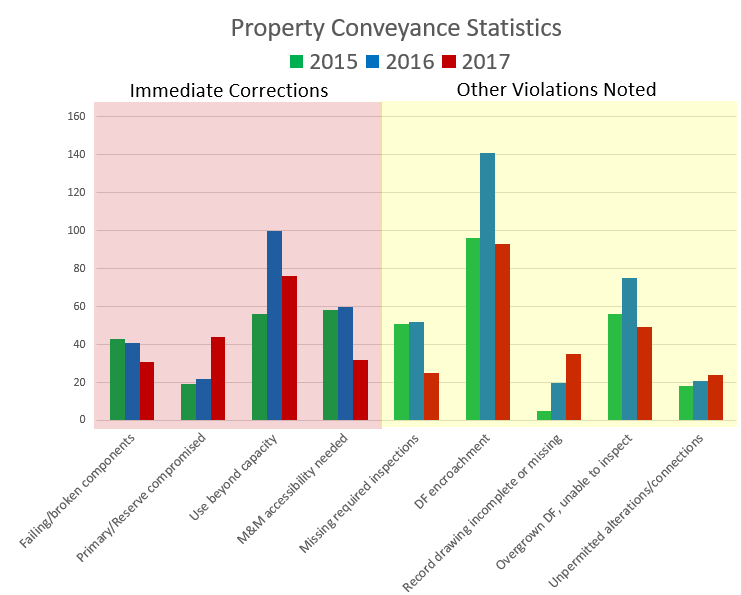 Need an amended Property Conveyance Application or Water Status Report for a property? You can fill out the online application or fill out the appropriate paper application from the options in the above list. Please allow seven business days for review and processing. Applications received after 3:30 p.m. will be dated as if received on the following business day. In this photo, a shop was illegally built on top of the septic drainfield of this home for sale, compromising the majority of the drainfield and potentially leaving a new owner with a big problem. This problem was caught and corrected before the home was sold. If your property does not have a record drawing, you will need to create one. Please follow the instructions contained within the Record Drawing Document.